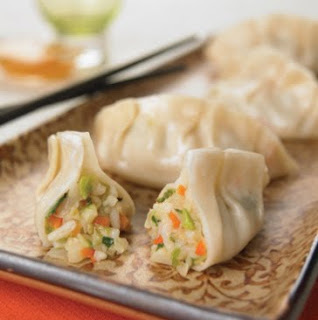 Dumpling recipes can be found in virtually any culture. They are high in nutrition and quick & easy to make. This recipe for Asian steamed vegetarian dumplings can be made with direct substitutions of vegan ingredients, if desired. THIS web site lists vegan substitutions for many ingredients. Feel free to add other ingredients, as desired, or to switch the types of mushrooms that you prefer. As for the Asian Seasoning ingredient, many different kinds can be found on the shelves of the larger supermarkets. Just be sure to read the ingredient list before purchasing it as some of them contained powdered anchovies. Asian seasoning of your choice. Mix all ingredients together (expect wonton wrappers). Fill wrapper with about 1 teaspoon of mixture and wet edges with water, fold and seal. Place small amount of water in pan until it steams, add dumplings, cover and cook about 12 minutes, adding additional water as needed. You may also use a bamboo steamer. Mix the vegetarian versions of the soy and teriyaki sauces and the citrus juice. Add seasoning and the dumplings are ready to enjoy!